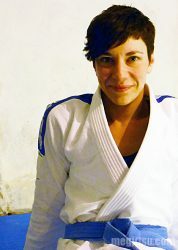 In July, US-based fightwear company, On The Mat, launched a new women’s gi, aptly named ‘Supa Star’. As soon as I saw this gi, I was in love; one look at the pink star styling and my heart was a flutter. It is the most glamourous gi in my little collection and my first pair of ripstop trousers. OTM’s gi are mid priced/headed towards the ‘premium’ end of the price spectrum ($159 + overseas shipping and customs charges if ordering from the UK), however you do get what you pay for in this instance; a tough wearing gi with a cut that can flatter a variety of women’s shapes. The Supa Star is in the ‘girlie’ range of feminine styling, but not too cutsie and the attention to detail ensures an overall sophistication. Epaulletts and ‘OTM’ branding at the back of the jacket are fashioned from pink fabric with an Argyle diamond pattern of white dashed lines, OTM logos and stars. A similar pattern is used inside the jacket, with dark pink on a white background. The slits at the sides of jacket’s skirt are reinforced with star-shaped stitching, and a lovely ‘On The Mat’ in a cursive font is used on the back and sleeves of the jacket to nice effect. The trousers, with thick dark pink cotton drawstrings, are further adorned with stars and ‘On The Mat’ script. The OTM is a lighter weight gi – it weighs in at 1.4kgs on my scale – with a pearl weave top and ripstop trousers, however, while the jacket is not ‘soft’, it is silky and gentle on the skin rather than rough as some pearl weave can be. If the beautiful Fenom Kimonos are the women’s tuxedo of gi, then the Supa Star is the ballgown. The Supa Star has a unique and very feminine cut that creates an A-line silhouette. The shoulders, the best tailored for me that I have found, drop in the perfect place and so avoid a lot of excess material in the upper-body. The jacket, as with other well developed women’s gi, flares slightly and is tailored and slim-fitting. The trousers, ‘modeled off the fit of a baggy women’s jean cut’, are very wide across the bottom and legs. On the one hand, for me, if I wear the trousers at the waist I get a huge unfilled balloon effect across the bum, and while this is somewhat reduced when worn more hipster style, they are much bigger through the rear than I would ideally prefer. On the other hand, the generous width of the trousers makes for comfortable and unrestricted wear, accommodates curvier shapes and enhances the A-line design of the gi. While it is great that there are women’s gi more sensitive to women’s proportions, there seems to be an assumption that all women are curvy. While women do have different waist to hip ratios than men, women too, come in a variety of body shapes and it would be optimal if women’s gi could be bought as separates. In this case, while the F3 jacket is perfect for me, I definitely need the F2 and possibly the F1 trousers. This is especially so with the Supa Star as not only is it very generously cut, but, for better or worse, it is extremely resistant to shrinkage. The Supa Star is very resilient to shrinking with no noticeable change after 40°C and 60°C washes. I blasted the trousers with a very hot 90°C wash, but this resulted in only the barest shrinkage. Incidentally, the dark pink fabric used in the design is highly colour fast and did not show significant fading after a very hot wash. The Supa Star is a pleasure to wear. It is lightweight and sensitive on the skin. It is so darn cute and pretty, you can’t help but feel like the belle of the ball which, if you’re anything like me, can have a positive effect on your jits. 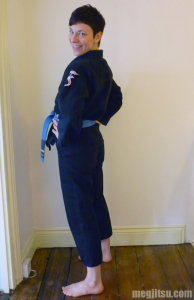 It is a very well designed and crafted gi that can survive equally well on the mats or in the washing machine. The styling and the cut are feminine and fun without being over the top and while this gi may be a little over-sized for women slight through the thighs and bum, it does have a superbly attractive and functional tailoring. I only hope that this is the start of a more extensive women’s collection from OTM, with the caveat that jackets and trousers be offered as separates. Big thanks to Coach Dave Birkett and Wayne Rowlands at Dartford BJJ for taking pictures with me and letting me have my way. Check out the OTM product page for close-up views of the gi’s detailing. Tatami Fightwear, UK-based purveyor of Brazilian Jiu Jitsu, Judo and MMA clothing, offers an impressive range of women’s products. 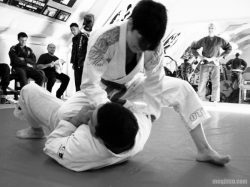 Tatami’s latest addition to their women’s line is the Zero G lightweight gi, advertised by Tatami as the ‘lightest ladies BJJ gi in the world’. The Zero G, at £63, can make an affordable addition to a BJJ-woman’s wardrobe. The Zero G kimono includes some interesting features, two of which stand out for me. The drawstring is a thick nylon cord. This is great, as it stays securely tied throughout training and sparring, but it is also easy to untie; I find that the cotton drawstrings of many gi get very difficult to loosen once they’re soaked in sweat, yet the knots often unravel during training. There is a generous drawstring channel so that the cord lays flat and can be easily tightened or loosened. The trousers are cut to have a slightly higher waistband at the back. This cut made them exceedingly comfortable. As is normal for lightweight gi, the lower thread count of the weave makes for a somewhat stiff fabric, so a rashguard – versus a crop top – will allow you more comfort in your roll. Finally, the Zero G weighed in at 1.3kgs on my scale and each gi comes with its own pack bag, which is a nice touch. The Zero G jacket has a tailored fit, designed to give ‘maximum competitive advantage’ by reducing material available for your opponent’s grips. For me, I really liked the tapered waist of the jacket, but found that it fit a bit like a small men’s jacket, rather than a purpose-made women’s jacket, i.e. it was wider at the shoulders and much tighter round the hips than I would ideally prefer. I found this fit somewhat uncomfortable and restrictive during rolling. The trousers, however, as I noted in the previous section, are extremely comfortable and didn’t disrupt my mobility in any way. Tatami gi are not preshrunk, but the size guide seems to accurately account for this. I washed the gi at 30 degrees, as per manufacturer’s instructions. The jacket and trousers both lost about 2 centimeters overall. The Zero G is an attractive-looking gi, with minimalist and IBJJF-compliant ‘bling’. It is also very affordable. To me, it has some distinguishing features, notably nicely designed trousers, as well as some drawbacks as regards the fit of the jacket. If you are looking for a lightweight gi for competition time or for weathering the last of summer’s heat that won’t break the bank, then the Tatami Zero G might be for you. 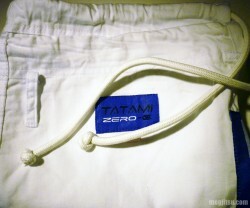 Thanks very much to Tatami for inviting me to review their Zero G women’s gi. All reviews are based on my independent observations. I have no formal qualifications, I am not sponsored by any company and I do not endorse any one brand. 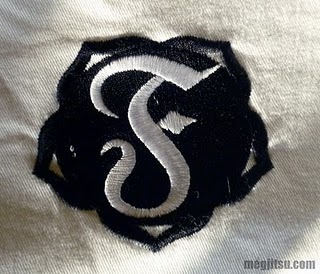 If you chose a gi based on my review, please let the manufacturer know that MegJitsu persuaded you. This will not benefit me financially, but can help me to get more gi to review. As always, thanks for reading. Fenom Kimonos, a dedicated women’s BJJ gi producer, has expanded their range to include a lighter weight white gi called Lotus to complement their Classic black kimono reviewed here. The Lotus is a beautiful new gi with an impeccably soft weave and subtle feminine styling; a great addition to any BJJ woman’s wardrobe. The Lotus gi is distinguished by its styling. 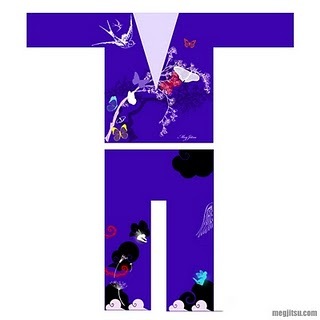 Fenom’s gothic ‘F’ brand is embroidered in black on the sleeves and at the bottom of the right trouser leg, while a black lotus-flower patch is stitched at the bottom left of the jacket and at the top of the left trouser leg. The Lotus is a lighter weight gi and weighs in at 1.5kgs on my scale (the Classic weighs in at 1.8kgs). While the Lotus jacket, a single piece crystal weave, has a normal weight, the trousers are a lighter weight canvas with reinforced areas around the knees and shins. While the Fenom Classic gi jacket has a shorter skirt, the Lotus has a more conventional length and extends over the hips. The trousers include a more generously proportioned back panel than many gi designed for men, and the A1 measures 22cm from waistband to the top of the gusset. This can provide a more comfortable and pleasing fit that accounts for women’s hip to waist ratios better than gi aimed at male proportions. Fenom’s gi are not pre-shrunk. After a 60 degree wash, the Lotus lost a centimeter in the jacket and 2 in the length of the trousers.The Lotus is generously proportioned and remains a great fit after this minimal shrinking. 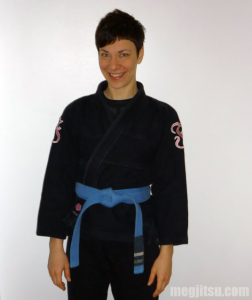 Moreover, the cut of the gi is adaptable and the A1, as modeled below, works for women along its size spectrum (Charlotte is 153cm and 40kgs while I’m 163cm and 60kgs). The Lotus is a beautiful looking, soft feeling, well thought out gi. Fenom continues to excel in creating products cut and styled for a feminine consumer. If you’re in the market for lighter weight gi to weather your summer training or to keep you in your weight category, at the bargain price of $75, the Lotus is a real steal! As of 2011, the Lotus ships with riptsop trousers which are reviewed here. Ripstop trousers are also available to purchase separately for $25USD + shipping. 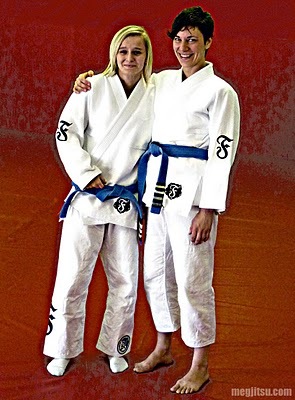 Fenom Kimonos is a new line of gi for and by women; as their slogan states, Powered by She! A fellow grappling grrl and I are proud to be the first two women in the UK to own these gi, which we modelled at a recent Women’s Open Mat. Since beginning BJJ-training in 2005, I’ve been a committed Koral wearer, gi which I find hard-wearing and nice-fitting. I was attracted to Fenom’s amazing introductory offer and decided to take a chance on my first non preshrunk gi, and I have not been disappointed. 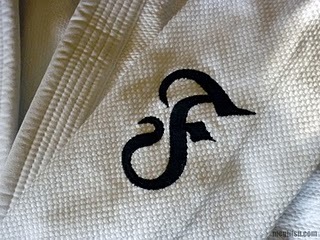 I’ve put my new gi through the ringer this week – training, washing at different temperatures, ironing and measuring – and I can confirm that Fenom’s created a great product backed by excellent customer service and an admirable corporate outlook. Two things immediately strike anyone encountering a Fenom, the superbly soft weave and the slick branding. The jacket and trousers are velvety soft and have remained so after two training sessions and two washes (without softener) and air drying. My Koral are superb, but their burlap texture does not compare with Fenom’s impeccable softness. While soft, the weave is sturdy and has a ‘proper’ BJJ-gi weight; I’m not a fan of the ultra-light gi. 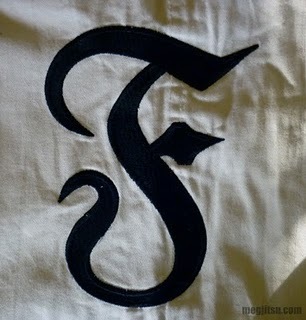 Fenom’s inaugural gi is black with pink gothic-style ‘F’ Fenom branding; smaller ‘F’s adorn the shoulders and a larger emblem is stitched at the foot of the right trouser leg. Fenom’s belts and internal tags also include a pink stylised lotus. Classy, feminine, but understated and not too saccharine or over the top (I’m not the sort to rock a Kyra Gracie pink kimono and it is nice to have a feminine gi that’s not exceedingly ‘girlie’). I’ve trained in Fenom twice, so while I can’t comment on the longevity of the gi (though it looks and feels sturdily constructed), I find it exceedingly comfortable. The cut and, especially, the fabric really can’t be beat. I think the boys are jealous their gi aren’t as baby soft! Fenom currently offers three gi sizes and I chose the A1. My measurements are at the top of the A1 range, but even after several washes I find the A1 a good fit. After minimal shrinkage, I really like the Fenom’s fit, especially the trousers. They’ve got a slightly roomier rear panel than my Korals to accommodate ladies’ ‘donk’, and while I’m not particularly blessed in this area and have quite a bit of excess cloth at the back once I’ve tightened the drawstrings, the trousers lay flat rather than gaping and puckering as my Koral MKM A1 trousers (see previous post for full details of Koral fit). The jacket fits my shoulders well and I am happy with the length of the sleeves, which, though they cut above the wrists, are comparable to my Korals. The jacket’s cut is a bit shorter than what I am used to, and though this is pleasing tailoring and means the jacket is loose over the hips, perhaps a bit more length after shrinkage would allow the jacket to be held together by the belt a bit better. The Fenom suffered minimal shrinking after washing at 40 degrees with negligible change after a 60 degree wash; I air dry gi, either on a clothes line or on drying racks hung from radiators. I heartily recommend Fenom and look forward to additions to their collection over the coming months. Not only is Fenom bringing a super product to the market, they are really channeling the ‘strong-woman vibe’ and working hard to bring more women and girls onto the mat. This is the sort of business I am keen to support, and with such a fine product, it is no hardship. Addendum: Meerkatsu has published a fine interview with Fenom founder, Triin Seppel, here. While I measured the waistband, I am sure that I made a mistake and the prewash measurement is not reliable (88.9cm/35″). Accounting for human error, there is no further shrinkage after the first wash.